got this for 9 year old after watching various videos online £71 on tesco direct. 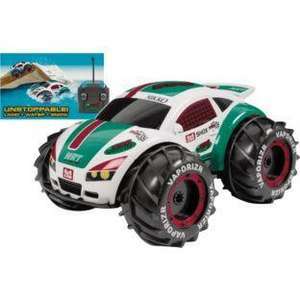 The Nikko VaporizR car is an unstoppable radio controlled all-terrain vehicle that works on land, mud, snow and even water! •Fully functioning transmitter operation: drives forwards/backwards/left/right. •Multiple engines provide 4x4 drive for super grip on all terrains. •Fully amphibious, including steering in water. •Includes a 1 hour quick charger. •Batteries required: 1 x 9V (included). I bought this for my nearly 4 year old yesterday cant wait for xmas. HOT!! its a very solid car but quite hard to control due to all wheel. independent drive. Good durable cars and worth it with the rechargeable battery. Had mine out with my son yesterday, 18 months old and it's still going strong. I got one for 19.99 at Halfords a few months ago. Good while the battery lasted but can only get 3 or 4 min usage from it now. Can't find replacement battery's either. Currently £24.99 at Smyths Toys. EDIT: Sorry, thats the 'Nano' version, slightly smaller. Judging by comments and personal experience, these seem very hit & miss. Our son got one last christmas, and the car was very unresponsive with the remote... sometimes it would work, others, it just wouldn't have it. Battery supposedly fully charged, but other seem to have been ok, so maybe just the one we got. I got one via flubit for £30 a week ago. The Smyths one is the smaller nano. WOAH, calm down.... have edited it now. Chill. This was £17 on HUKD around a year ago - i bought it then. It's ok, but would have been VERY dissapointed if I paid £70 for it. Been this price on amazon for weeks. It's great to see it go in water though, and it drives pretty well on a lake ! WOAH! Everyone look out, the internet police are here. This was £17 on HUKD around a year ago - i bought it then. It's ok, but … This was £17 on HUKD around a year ago - i bought it then. It's ok, but would have been VERY dissapointed if I paid £70 for it. Bought one for my son last Christmas. Great fun. Bought another for £17 via IWOOT earlier on this year. Gonna give it to my mates son for Christmas this year!